I am traveling so please excuse the photo. 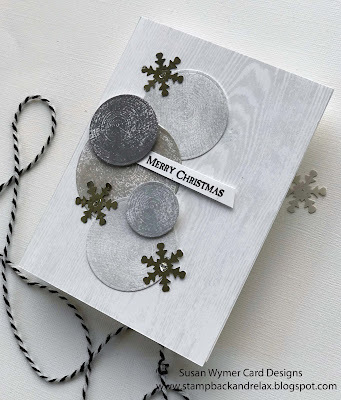 Impression Obsession has a Quick Holiday Card challenge up on the blog - here. Go to the latest post. So my card...I made it in my old bedroom at my mother's house so it had to be quick! 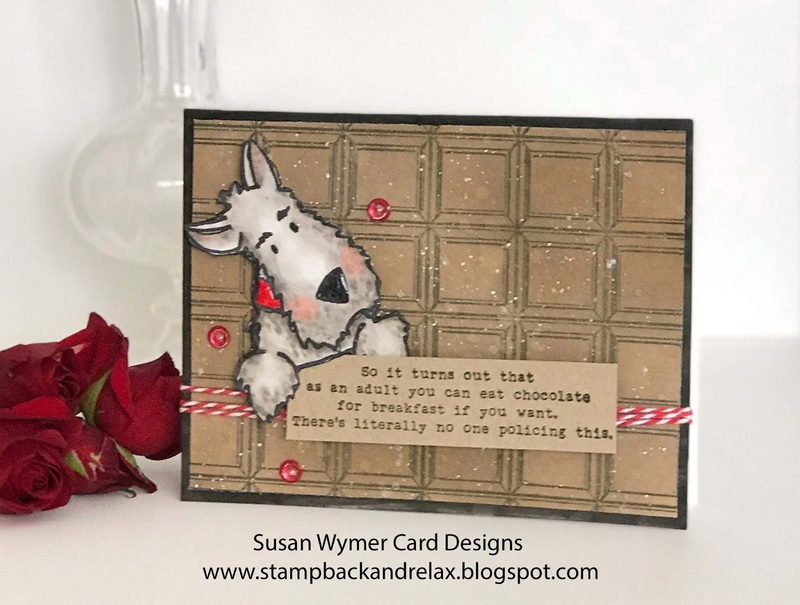 First, I stamped the chocolate bar background with Memento Tuxedo Black ink onto Neenah Desert Storm kraft paper and then used Hero Arts Cup of Joe and the Picket Fence Life Changing Blender Brushes to soften the panel a bit. Then I splashed shimmer spray in silver and gold over it. I stamped the sentiment in Versafine Onyx Black and now I need chocolate just writing this. I stamped Darby Love in Memento Tuxedo Black onto Neenah Solar White Smooth 80 pound card. I used various shades of Copic markers to color him. I added a bit of twine and some foam tape and it was done. Thank you for stopping by and I hope you join our challenge! 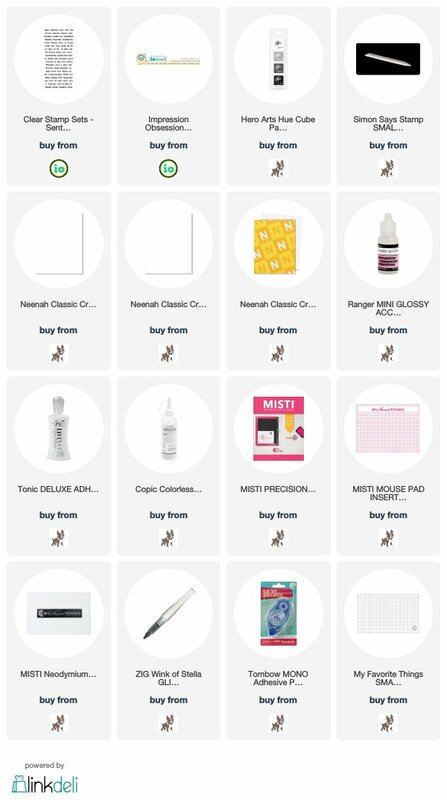 Supplies Used: I am using affiliate links at no further cost to you. I was given the stamps as part of my design team work for Impression Obsession. So sorry I have been absent. I have been traveling to take care of my mom. 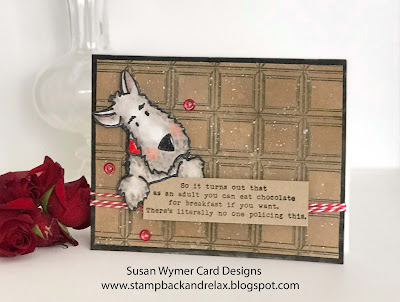 I have my second card for the Picket Fence Studios December Release. 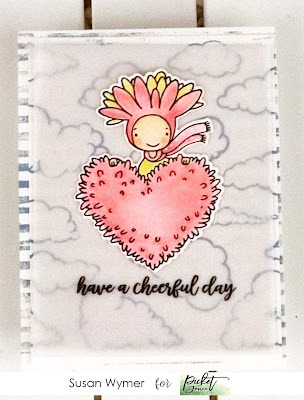 I used Have a Cheerful Day along with On A Cloud of Dreams and Rough Around the Edges. I stamped both background stamps with Hero Arts Cornflower ink. 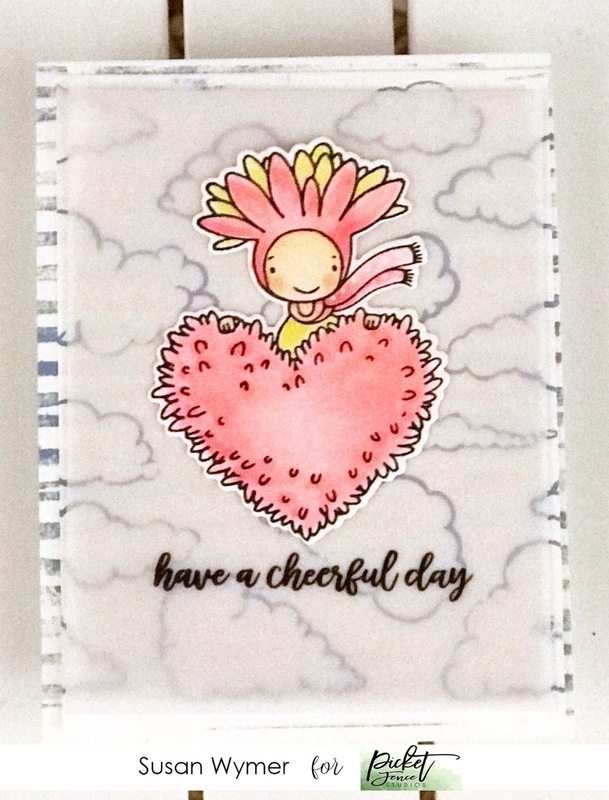 Then I stamped Have a Cheerful Day with Memento Tuxedo black. I then colored the image in with my traveling set of Copics. I would have added white dots to her crown and scarf but my gel pen dried up.....my mom's house is very hot and dry lol!!! I am used compensated affiliate links at no further cost to you. I received the Rough Around the Edges and Have a Happy Day for free for my design team work for Picket Fence Studios. 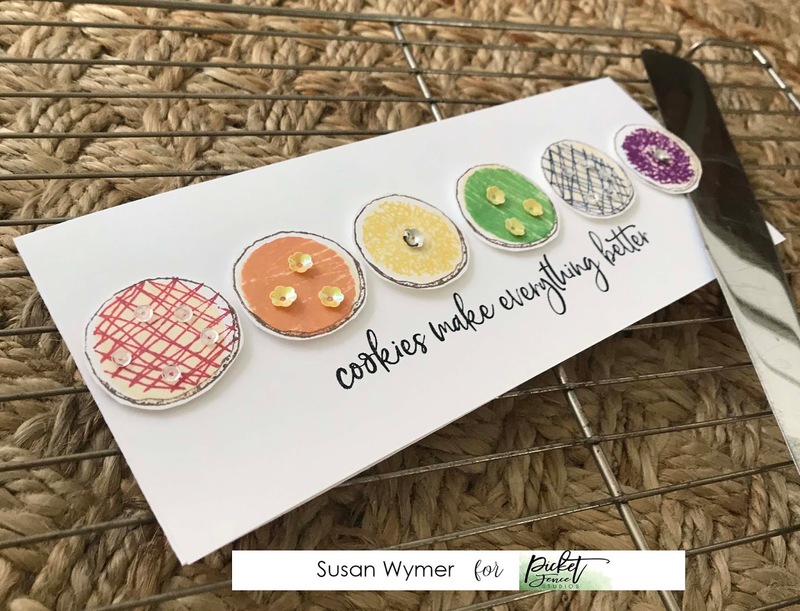 Picket Fence Studios December Release: Anyone for a rainbow cookie? 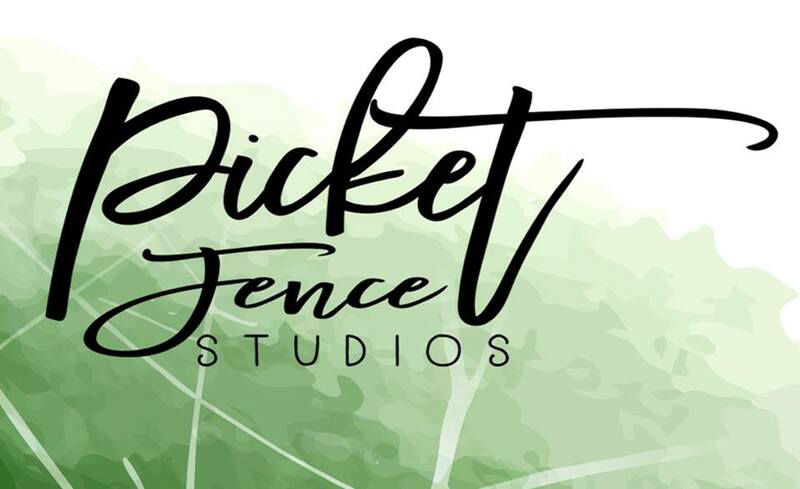 I am up on the Picket Fence Studios blog today. The December Release is adorable and features some great stamp and die sets. I chose to use the xxxxx set as it is holiday baking time but I wanted to bring a bit of Spring into the design. I just love rainbows and they are the perfect thing for this dreary weather as I am in Boston with my mom and not in sunny Florida lol! This is a 3.5 x 9" card so I could pack in a almost full rainbow of cookies. unfortunately, I had to leave out the cerulean blue color of the rainbow! 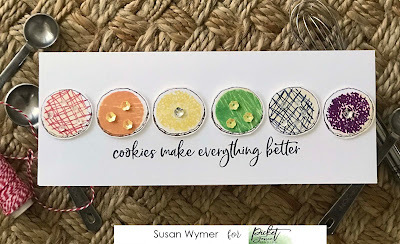 Using my Misti I stamped the cookie shape with a mid-tone brown ink and then using the layering cookie image to stamp with a very light vanilla ink. This made my sugar cookie shape - these are my favorite cookies at this time of year. I used various shades of ink to add the frosting and make a rainbow. I finished off each cookie with some sequins. I stamped the sentiment in Versafine Onyx Black. I have linked to the new release below and the supplies I used. I hope you are enjoying the holidays. Thanks for stopping by! Products Used: I am using compensated affiliate links at no further cost to you. I was given the stamps as part of my design team work for Picket Fence Studios! Welcome to the Impression Obsession Winter Hugs Hop! For this card I used the cling mount wood tree ring stamp and a sentiment from an older stamp set. I stamped the tree ring in multiple times in various shades of grey ink. I then die cut them using an older set of circle die cuts. 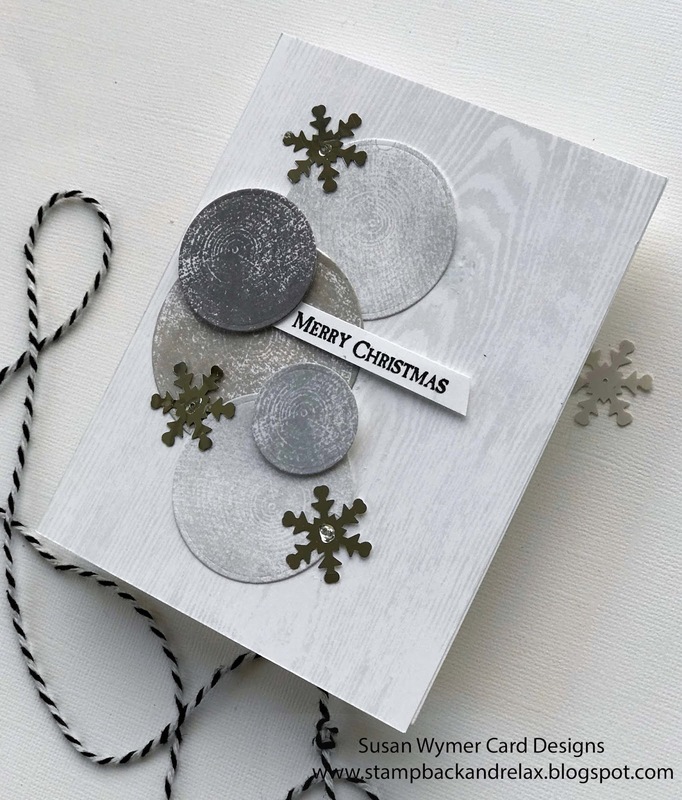 I stamped the background with the Cover a Card Wood Grain background cling stamp in a blue grey ink. The texture of the stamp and the glitter I added from Wink of Stella clear brush pen is just not showing up in this picture. It sparkles in real light! Please leave a comment below saying which of the new release is your favorite. Comments close December 16th at 12P CST. I am using compensated affiliate links at no further cost to you. I received the stamps for free as part of my design team work for Impression Obsession. Here is my first card! 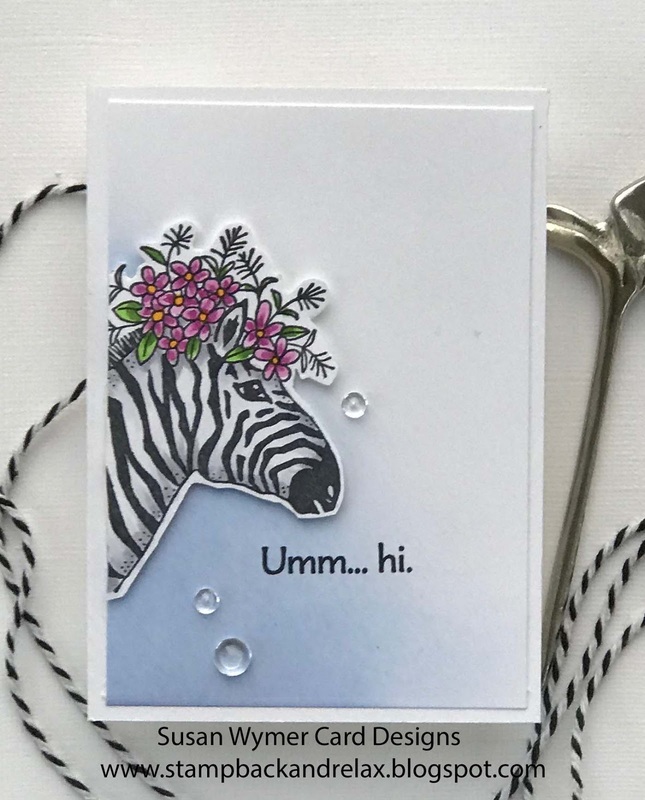 I just had to use the Floral Zebra......she is so cute! I adore her floral hat. For the background, I did some easy ink blending with various shades of blue ink. I stamped the image onto Neenah Solar White with Memento Tuxedo Black ink. I used some simple Copic blending to make the image pop a bit. I then fussy cut it out and mounted it onto the ink blended panel using foam tape. So easy to make. And that sentiment.....ummm adorable! So please comment below to be eligible to win a $10 gift certificate to Impression Obsession's store. Comments close December 16th at 12P CST. Products Used: I am using compensated affiliate links at no further cost to you. I received the stamps for free as part of my design team work for Impression Obsession.